It's official! We are excited to announce the launch of our Olympic National Park Guided Tours. Are you ready to explore the top destinations in Olympic National Park? We sure are! Our Saturday tour begins by giving our group hike a 5,000 foot head start, as we drive from sea-level to the summit of Hurricane Ridge! Enjoy a front-row view of the snow-capped Olympic Mountain range and gorgeous subalpine terrain along the Hurricane Hill trail. After a morning atop the ridge, we'll descend back down to Port Angeles and grab items for an hour picnic lunch at Lake Crescent! Our group will spend the rest of the afternoon in the picturesque Sol Duc Valley. In less than a mile, we are able to hike to one of the most breathtaking waterfalls Olympic National Park has to offer, Sol Duc Falls. We will be surrounded by beautiful old growth forestry as we descend into the river valley. Upon reaching the falls, our group will cross a rustic nature bridge which spans over the roaring Sol Duc River, providing an incredible vantage point! What did you do last Sunday? Did you explore one of the largest temperate rainforests in the United States or walk amongst towering sea stacks along the Pacific Coast? Good news! You can now accomplish both on our new Sunday guided tour! Our first destination is the always-impressive Ruby Beach! High tide or low tide, sunny or cloudy, this Pacific Coast gem never disappoints. Ruby Beach is decorated with colossal sea stacks and massive driftwood logs are scattered along the shoreline. After our beach explorations, we'll head to the Kalaloch Lodge for an oceanfront lunch! Spend the remainder of the afternoon wandering amongst mossy giants and the lush green vegetation in the Hoh Rain Forest. 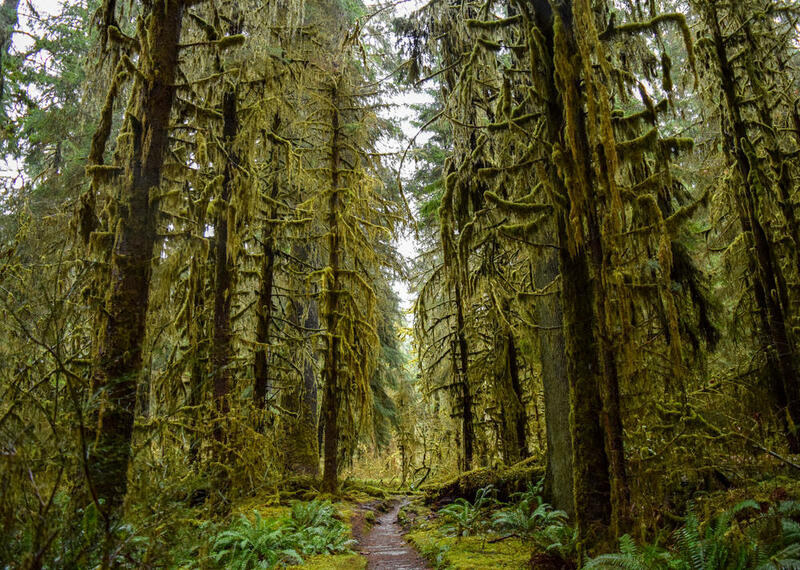 We will venture on the Hall of Mosses nature loop, which provides some of the most picturesque views the Hoh Rain Forest has to offer. Green as far as the eye can see! Our Wednesday half-day tour to Hurricane Ridge is the perfect mid-week pick-me-up and a great option for walk-on passengers aboard the 10:20 AM MV Coho Ferry from Victoria to Port Angeles! We will venture along the Hurricane Hill trail which provides incredible views of the Olympic Mountains, the Strait of Juan De Fuca, and gorgeous subalpine landscapes. For a flat fee of $499 and up to 11 passengers, our group tours are perfect for families or special events and allow you to customize your own Olympic National Park adventure! Want to explore Olympic National Park without battling the ferry backups or traffic? Leave your car in Seattle and take advantage of this special group tour offering, which provides a Bainbridge Island Ferry Terminal pick-up location! Simply catch the 7:55 AM ferry from the Downtown Seattle Ferry Terminal, choose your own Olympic National Park adventure, and we'll have your group back for the 5:30 PM return sailing to Seattle! Customize your own group tour! Conquer a bucket list item and hike to the most northwestern point in the continental United States on the scenic Cape Flattery Trail, a true coastal gem! West Coast does equal Best Coast. Spend a full-day in La Push exploring some of the best beaches along the Pacific Coast! Wander for waterfalls and visit three beautiful Olympic National Park waterfalls: Madison, Marymere, and Sol Duc! We are open for your adventure ideas! Contact us for how you want to customize your own group hiking tour in Olympic National park. Are you ready to create the ultimate Pacific Northwest adventure in Olympic National Park? Whether you want to join our Saturday and Sunday tours or customize your own group adventure, we are excited to explore the top destinations in Olympic National Park with you. The possibilities are endless, let’s start planning your next adventure today!